The June Update #1 has been released. There are 4 new planet constructions for diplomacy and a diplomacy plan. Diplomacy action Trade Embargo was implemented (no UI at this moment) and more achievements is available now. All changes are available only if you start a new game. Hello everyone! The May update #2 has been released. The game supports achievements and trading cards now. The Empire designer has a new shield section for the ships so you can set an exact shield value for each side. The next month will be all about better diplomacy, so stay tuned. Hello everyone! The May update #1 has been released. The game was updated to the Xenko 2.0 engine and a new FXAA feature added to options. Empire designer has a new Fleet section, where you can set attributes of your starships. Hello everyone! The April update #4 has been released. There are new features for the Empire Designer. You can give name to home star/planet now and there are categories for layer images. If you want to help with a localization, you can find localization files on GitHub[github.com]. The April Update #3 has been released. It comes with the Empire Designer (aka race designer). 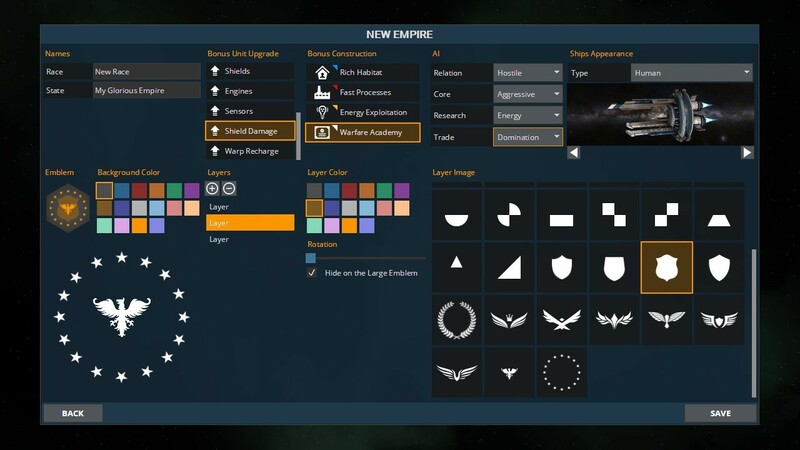 You can create your own empire with a custom emblem, select bonuses, AI and ships appearance. I will keep adding more choices and emblems in future versions.